So this week has kind of, well for lack of a better word … sucked! After an amazing gift from God in the form of a Blessed weekend of Roping, things seemed to just turn. First, Gigi passed away without warning and then Daisy. 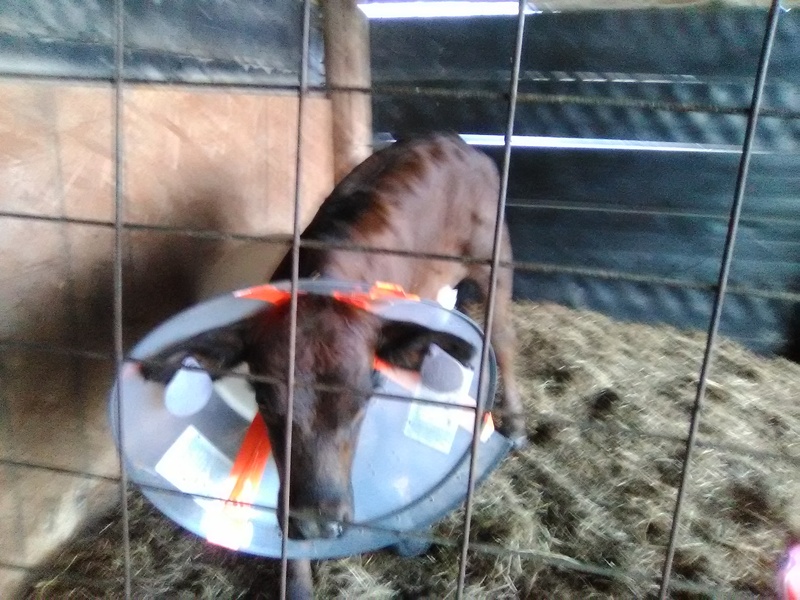 The Vet thinks the Calf’s knee is blown, I have court tomorrow and we are trying to finish up the hay. I have to be thankful for all I have but right now it is just a bit hard. So Gigi was showing signs of being thin and just seemed Blah. 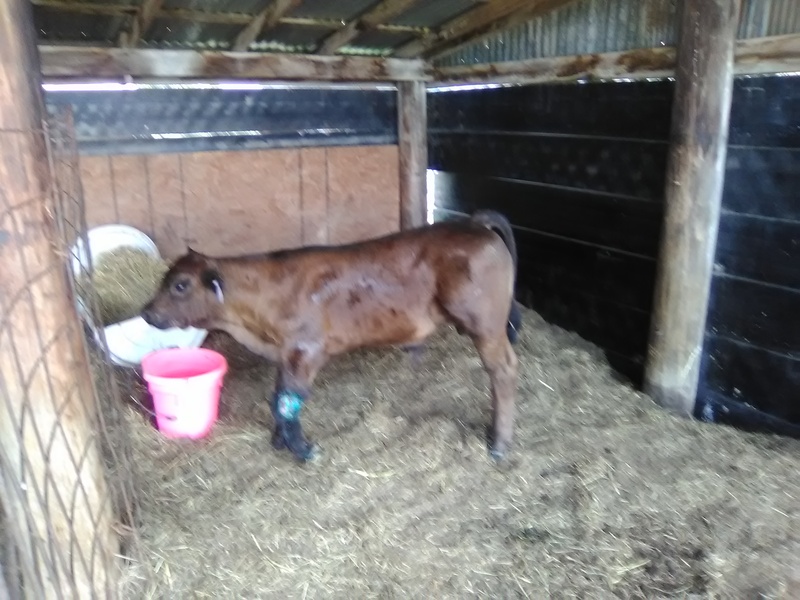 Nothing we could put our finger on so we put her in the watch pen and called the Vet. 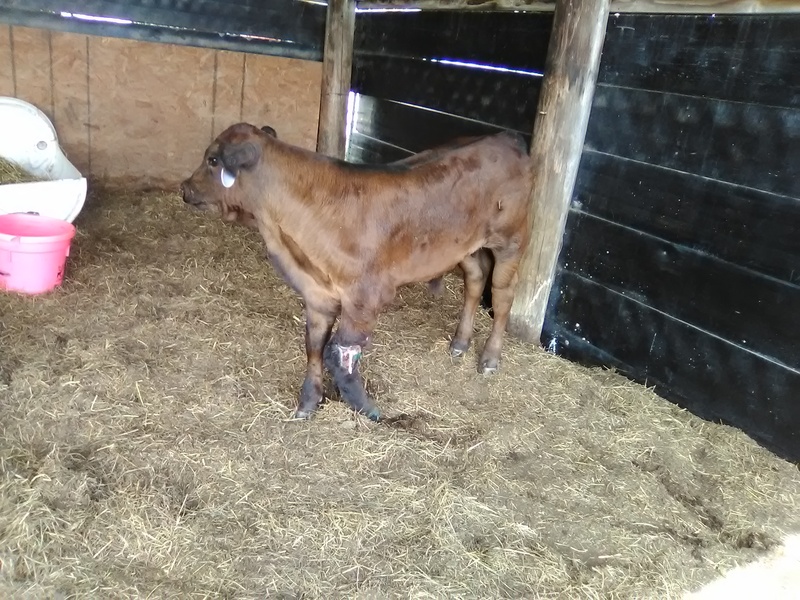 We changed her wormer and she seemed to do much better. She went back to eating her meals and even ate cookies during farm visits. We thought she was on the down hill slide and just needed to put the weight back on. 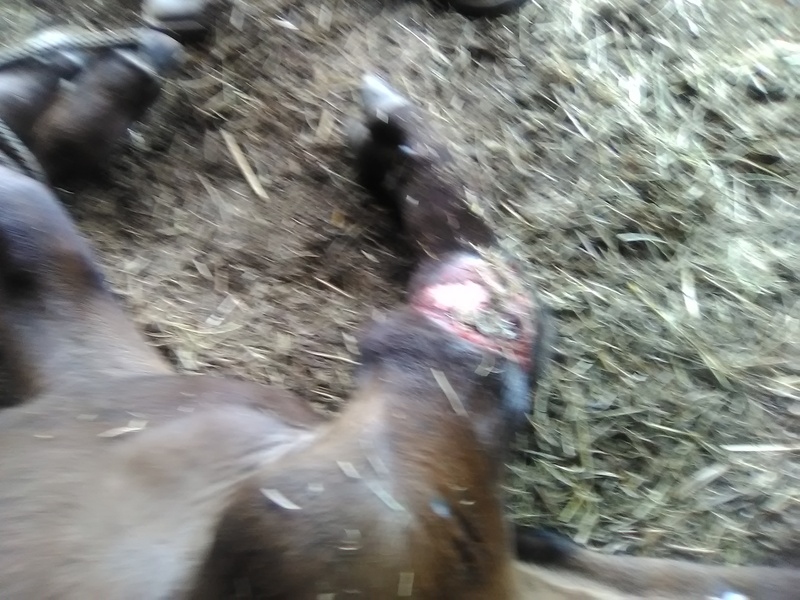 That was until we went out to go to the barn and found she had passed away. She had just laid down as if to sleep and didn’t wake up. It was tough to take. It came out of nowhere. She was Carrie’s big Girl from last year. She survived a hard birth and came into this world weighing 16lbs. It just didn’t seem fair and we don’t even know what we could have done to keep it from happening again. 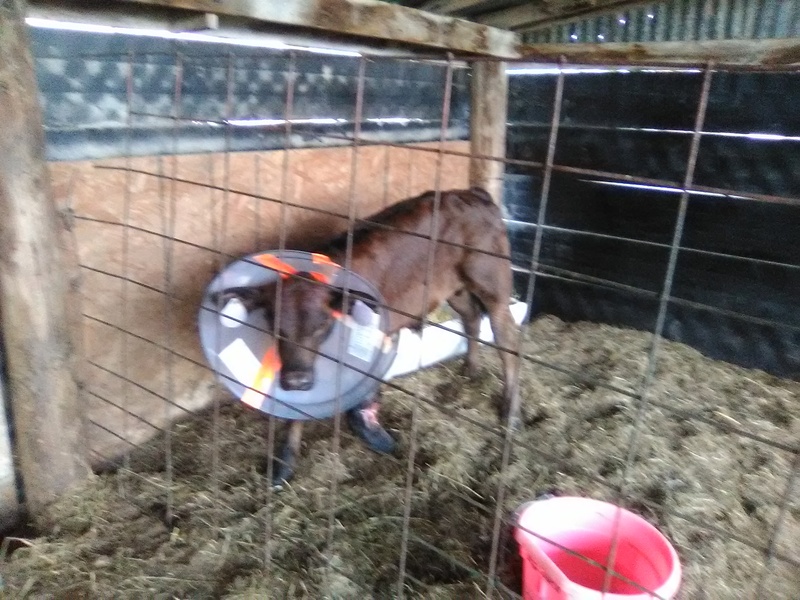 To add to our frustration our Gordy the calf May have a blown Knee. We are working to figure out a way to get it to drain the infection out better. It seems to be draining less and we aren’t sure if that is a good thing or not. We are doctoring and praying but for now we are trying a few new things with hopes of getting all the infection out of his body. To top it all off I have court tomorrow so that a judge can figure out I wasn’t drunk or High on anything when I had my wreck. Then with any luck I will be able to convince the court to give me a break and not report it to my insurance history so that Mom and Dad’s insurance doesn’t go up. Oh and let us no forget that Dad is cutting hay. And if you have followed us for any other haying season you know Dad gets in a mood when he is haying. Just this morning he took my head off because he didn’t get up earlier. That lead him to gripe that Mom and I didn’t get to town to get gas for the tractor until late. Why do we have to have times that test us so??? I know I am supposed to be Thankful and I am but I wish I didn’t have to deal with all this at once. So I have been getting on doing the daily chores and working. throw in my roping and that is about all I have been doing. Then today something happened that I think you all will be interested in. However, this post isn’t for kids or weak stomached people. I have to admit I wasn’t ready for it either. I mean Mom and I have dealt with a lot of things but somehow you are never ready to see something that you haven’t seen before. So what am I babbling about?? Well, Meet Poor Boy. Poor boy, as Mom has come to call him, is a 220lb baby boy that has an issue. He is super sweet and has let us do everything we need to do with very little fuss. It will break your heart to know what pain he is in and that we have to cause more the help the healing process. 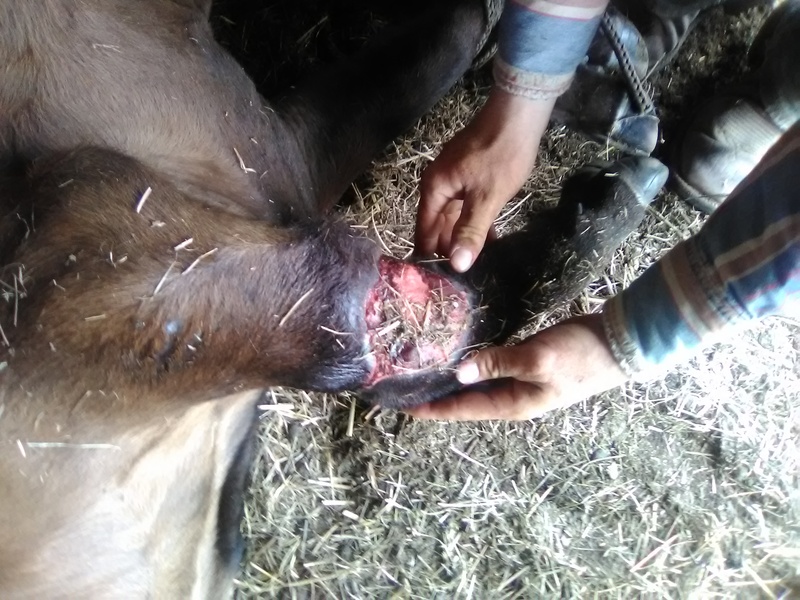 From what we can figure Poor Boy’s leg got tangled in a wire or fence of some sort and wasn’t found until after infection set in. The wound wraps all the way around his leg just above his left knee. 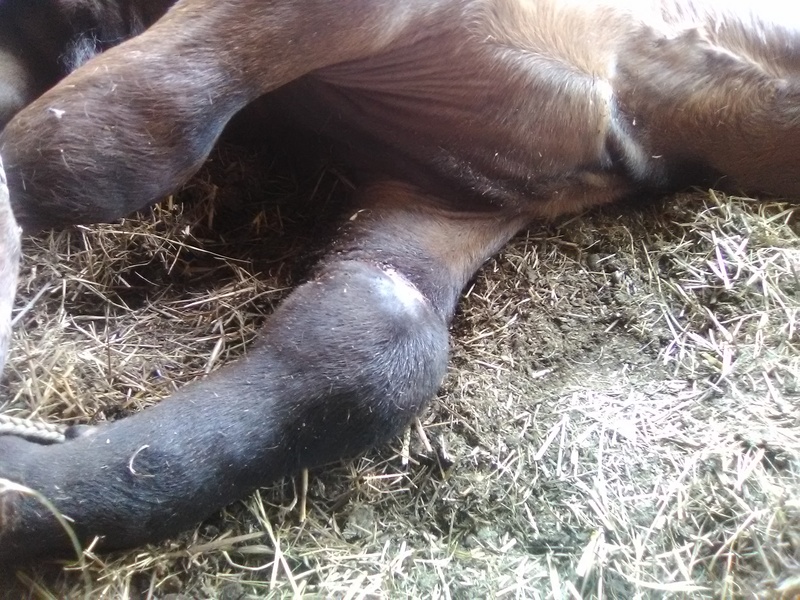 The inside wound is not so bad but The wound on the outside of his leg however is infected and unsightly. When Mom brought him home I spent time cleaning both wounds out and doctoring Poor Boy. Everything from antibiotics and tetanus shots were given and then I called the Vet and explained the issue. Doc had me change up some of the medication I am putting on his leg and we will be doctoring it twice a day. Through out the day Mom goes out and gets him up and gets him Moving. As she does it encourages the wound to drain. It isn’t pretty but to us when it drains we think it looks great as it is promoting healing. Another issue with Poor boy is that he can get his head and mouth to the wound. That means the first time I doctored the wound, once I got him up he licked all the medication off the wound that I had just put on. Mom headed to town and picked him up the famous … CONE! 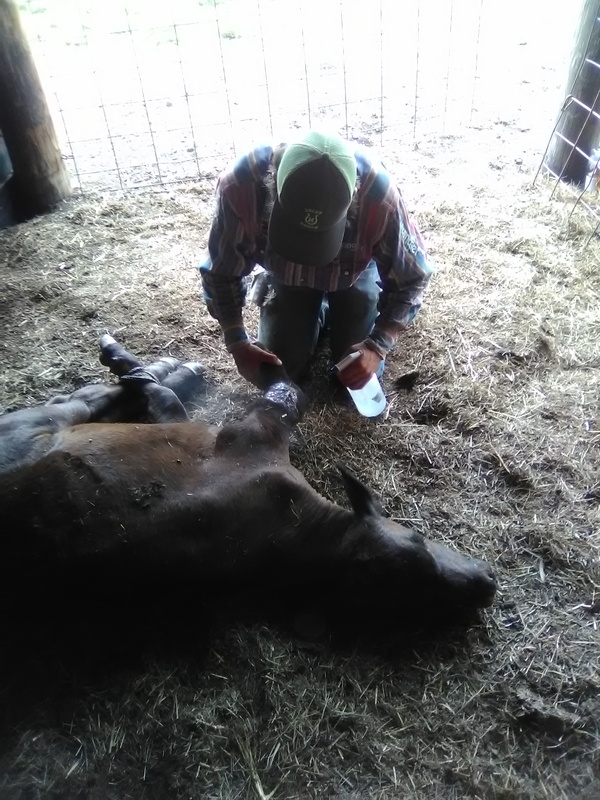 It isn’t pretty but after we got him up from his second round of doctoring we liked the fact that he couldn’t lick off everything we just did. Poor boy was super angry with us. Then tonight Mom decided that she was going to put him on a bottle. He was taken from his Mom today so even though he is a bit big for a bottle it will make it so much easier to doctor and handle him. Things like antibiotics can be put in his bottle for easy administering along with vitamins, minerals and electrolytes. It will also keep him a bit tamer to us because he won’t see us just as someone who will make his leg hurt but he will also see us as food and help. 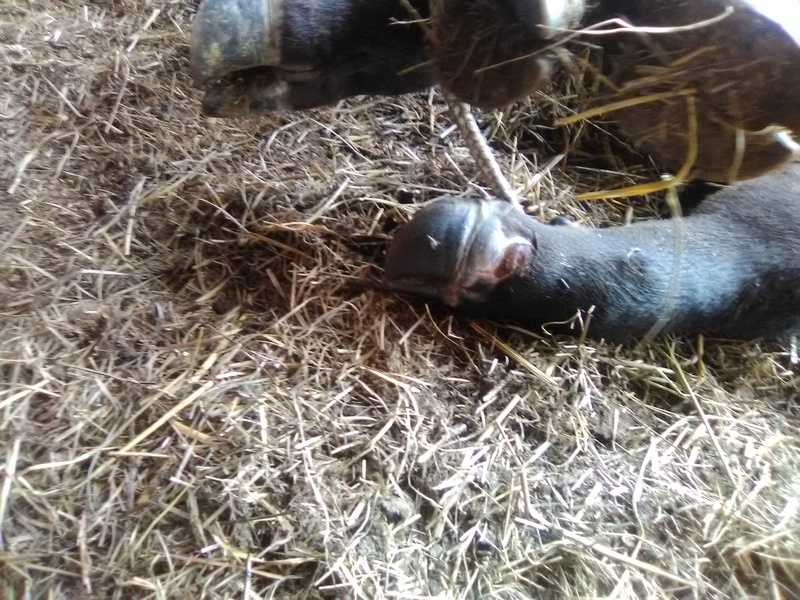 And Doc says a bonus of bottle feeding him is that when he gets worked up for his bottle it will encourage drainage in the wound as well. The last issue for Poor Boy is that I am open for ideas for a different name. We can’t keep calling him Poor Boy! Any Ideas? ?